In my remarks to the College’s graduating Class of 2018, I noted an article in The New York Times by former Secretary of the U.S. Treasury Robert Rubin, entitled Philosophy Prepared Me for a Career in Finance and Government. In it, Rubin describes how an undergraduate philosophy course influenced his life and shaped his career at Goldman Sachs and in government by helping him recognize the power of critical thinking, including asking important questions and understanding there are no provable certainties. Recognizing that Rubin and I share similar perspectives on the power of philosophy and the importance of critical thinking, I realized while reading his piece that we also share a similar experience of a first philosophy class that shaped our futures and directed our careers. While Rubin entered the world of finance and economics, I continued to study philosophy in graduate school and have spent considerable time in my career examining ways to bring important elements of the discipline into everyday thinking. The practical application of philosophy is particularly salient for today’s graduates, especially in polarized political and social climates. Crucially important is the idea that you can learn the most by listening carefully to those with whom you disagree, and in so doing, open doors to civil conversations and respectful debate. I am certain our 2018 graduates will enter the workforce or continue their education in environments where they will encounter a myriad of positions, opinions, and beliefs that are different from their own. I am equally certain that their time at Rochester and the critical thinking skills they learned here will give them the foundation and the career preparation to be collaborative colleagues who will have the confidence to follow paths that inspire and interest them and drive their untiring dedication to being ever better. Chances are that it will be a world that many of us might not recognize, just as Frederick Douglass would likely have not recognized a commencement ceremony where he was honored and celebrated, 123 years after his death, as one of America’s most iconic and influential abolitionists. But it is that hopeful notion of change and the spirit of our University’s mission that drive our celebration of commencement each year. We are at our strongest when we move forward together as a community connected by our great admiration of and respect for this institution. To the Class of 2018, I offer my sincere and enthusiastic congratulations. Our recent graduates are as well prepared for life’s challenges as any class the University has ever graduated, and they will succeed because of their talents, dedication, and strong work ethic. They have already made us proud, and we look forward to all the remarkable ways they will contribute as informed, engaged, and socially minded citizens. Welcome to Words from Wallis Hall. 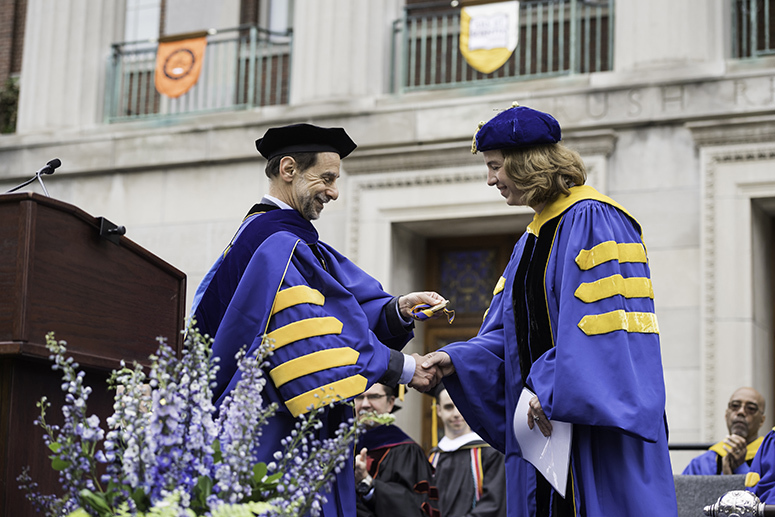 This regular communication from President Feldman will serve as an ongoing opportunity to share important updates on the University’s efforts to strengthen a culture of respect, and to keep the campus community informed of people and programs that make Rochester a world-class institution.